Jenny was raised in Calgary, AB and started her mentoring career at Lord Beaverbrook High School in 1999. She was one of the leading mentors in the Health In Perspective program (H.I.P. program) at Acadia Elementary School. She held trainings for other high school mentors and helped expand the program through Southern Alberta. Jenny received the Outstanding Leadership for 1997-1999 at Wilma Hansen Junior High for her service to the school and students. She was awarded the Major Citizenship Award in 2002 at Lord Beaverbrook High School for her dedication to the leadership program and her volunteer work in the school and around the community. Jenny also received the Don Stowell Scholarship Award of Dedication in 2002. Jenny has experience in management holding positions with GoodLife Fitness (2005-2006) where she was selected as one of the top General Managers of GoodLife Fitness to be rewarded with a trip to Australia in 2006. From May 2007-February of 2009, Jenny spent her time overseas in the Caribbean developing the kids program for a hotel in St. Maarten N.A. In her spare time, she coauthored the Heart-to-Heart manuals and became a facilitator for the Virtues Program. After completing the Bachelor of Science degree in Health Science from Mount Royal University Jenny accepted a new role with Nurse Next Door Homecare Services. Her team was awarded the Admire People Core Value Award in September 2014. In 2016, Jenny decided that becoming a midwife would be the best way to pursue her dreams of helping women and families during pregnancy, childbirth and the early stages of child rearing. She has since returned to MRU and is now completing her Midwifery Degree. In recognition of her dedication to mentorship and academic achievement, Jenny was the recipient of the 2018 Outstanding Future Alumni Award at Mount Royal University. 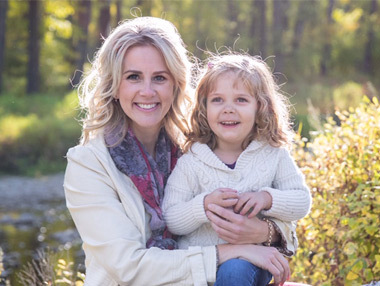 Jenny is raising her daughter Ophelia with the support of family and completing her Midwifery Degree at Mount Royal University. She is continues to volunteer as a Senior Learning Peer and Mentorship Circle Facilitator. Mary Appleton-Dias has been an educator and mentor for the last 25 years. She has taught and held administrative positions in both Ontario and Alberta. In her time with the Calgary Board of Education she coordinated the implementation of Comprehensive School Health in 86 schools, collaboratively developed the TEAM Leadership Program (now an Alberta curriculum) at Lord Beaverbrook High School , coordinated Partnerships That Impact Student Learning across 4 high schools, and mentored teachers in their growth and development as an AISI Learning Leader in 4 schools. Her background and training as a Lions Quest Trainer, Resiliency Coach, Safe and Caring Schools developer and Challenge Days mentor all reflect her passion for youth and her belief in their ability to positively change the world. DeeAnne holds a Ph.D. from Michigan State University in Family Ecology, a BSc and MA from Ball State University. Dr. Vonde was awarded the Prime Minister's Award for Teaching Excellent in 2001, for her work in developing the T.E.A.M. Leadership program. T.E.A.M. leadership is a student driven, service based high school program. She received the People First Award in 2005, presented by the Calgary Health Region for her work on the sexuality website. DeeAnne received the Pan Canadian Learning Innovation award in 2001. In l998, l998, and 2000 she was nominated for the Pan Canadian Student Choice Award. She is a past member of Phil Delta Kappa. In l999 she was the President of the Calgary Chapter, Foundations Representative for the Calgary Chapter, l997-l999, Winner of International Newsletter Award, l995, Winner of the Bessie Gabbard Award, Special Commendation for Phi Delta Kappa International, November, 2001. She is presently a volunteer on the Neighbour Grants Committee of The Calgary Foundation and a member of the board of YouthInkIt Publications, a nonprofit society. Dr. Vonde has written several books and journal articles and presented at numerous conferences. DeeAnne lived a happy life married to Tom, mother of Chris, Laurel and Eric, and grandmother to Jae, Easton, Ty, and Harrison. Copyright © 2009 Heart-to-Heart Mentoring Inc.